One of the main goals of ScreenSteps is to make it fast and easy to author great looking, visual documentation. In order to meet that goal we offer two articles editors. One article editor is available in the ScreenSteps web browser application. The second article editor is a desktop application that you download and install. Use the desktop client for any authoring that involves working with images at all. The desktop has a screen capture tool built in along with annotation tools. Use the web interface if we just need to make quick edits to the text of an article. If you haven't done so yet, we strongly recommend you view our ScreenSteps concepts videos to give you a quick understanding of some of the basic concepts behind ScreenSteps. Whenever you want to edit an article, you will be presented with the option of editing in the Desktop or on the Web. The following screenshots show what you will typically see. Simply click on the option of corresponding to the editor you want to use. If you don't see the Edit on Web option then the article you are trying to edit was created in an older version of ScreenSteps. The web editor only works with articles that are stored in the new format. 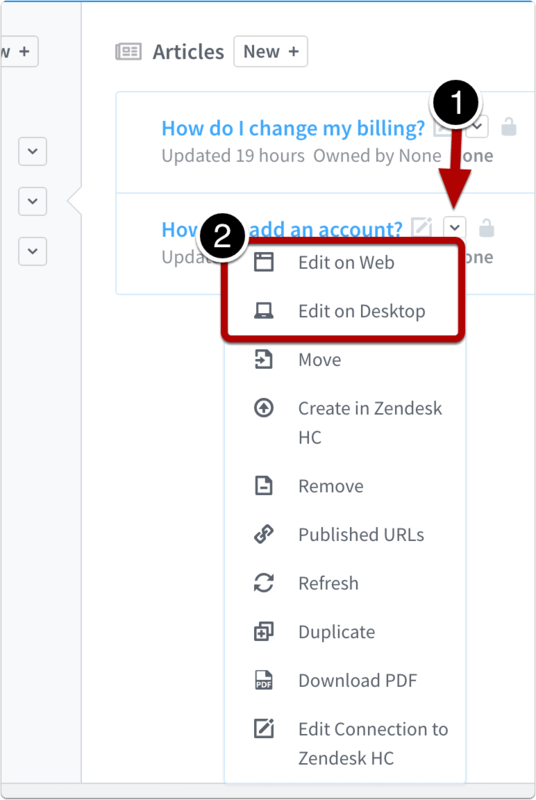 After you edit the article in the desktop editor you will be able to use the web editor the next time you want to make an edit.